Can Computers “Get” Emoji? EmojiNet Says YES! Sorry Freud. But when it come to emoji, a cigar isn’t always a cigar (if there was, in fact, a cigar emoji). 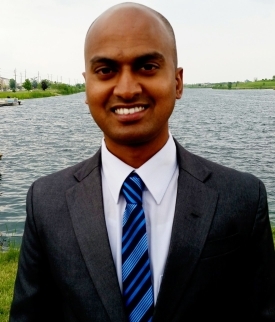 In 2016, Wright State University computer science Ph.D student Sanjaya Wijeratne was working to identify at-risk youth using social media posts. While following twitter accounts of the gang-affiliated youth he began to notice unique emoji uses. Tweets expressing anger towards law enforcement, for example. frequently featured gun and police officer emoji. Flash forward to EmojiNet, the first machine-readable sense inventory for emoji, developed by Sanjaya and his group at Kno.e.sis, a project of Wright State University. Since Sanjaya’s gas pump epiphany, he and his team composed of fellow graduate student Lakshika Balasuriya, and advisors Prof. Amit Seth and Dr. Derek Doran, published three papers on their work, and are currently developing applications to help computers automatically infer emoji meaning. Sanjaya’s research on emoji is closely related to the concept of semantic search, a growing area of study and application related to database and web searching. Rather than searching by keyword, semantic search considers the searcher’s intent and the context in which search terms are used to improve accuracy, and generate better results. Semantic search has huge implications for search engine optimization, as users have begun to lengthen search queries to gain more precise results. Google recently reorganized its search algorithm to consider context and intent, prioritizing the “understanding” phase of search over “achieving”, “filtering and clustering” and “ranking”. So how do we figure know what a word means in a given context? For us, it’s mostly subconscious. For computers? Not so much. One of the cornerstones of semantic search is word-sense disambiguation. Word-sense disambiguation is a long-term with a simple meaning: determining the meaning of a word used in a particular sense, when the word has multiple possible meanings. Sanjaya and his team are developing programs to help computers detect and understand multiple meanings of emoji. In other words, they study emoji sense disambiguation . An easy way to understand emoji sense disambiguation is to compare the results of two open source emoji databases. 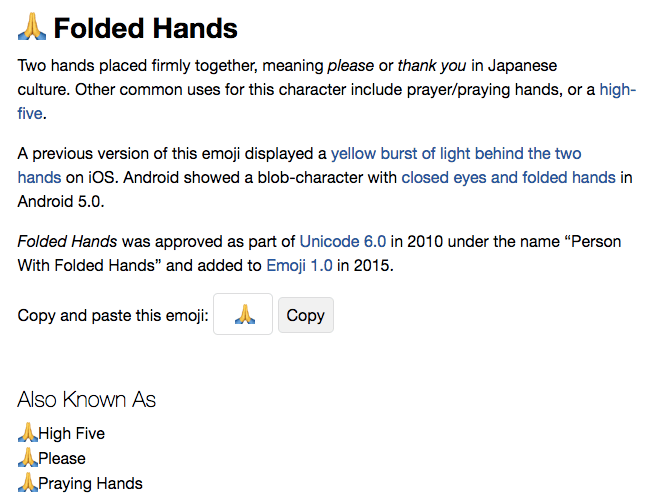 Whereas Emojipedia gives a short, concise definition of the “folded hands” emoji, Emoji Dictionary, on the other hand, provides a flexible list nouns, verbs, adjective, adverbs and examples, indicative of user intent and context. Sanjaya and his team’s goal was to create a machine readable “sense inventory” of emoji, so computers could understand the semantic meaning of an emoji in a particular sentence. Upon discovery of several open source emoji databases online, including Unicode Consortium, Emoji Dictionary, iEmoji and Emojipedia. the team extracted contextual and part of speech meaning (noun, verb, adjective, etc.) of each emoji from Emoji Dictionary, then integrated the information with Babelnet, a multilingual semantic dictionary and database dedicated to word-sense disambiguation. EmojiNet is the first machine-readable sense inventory for emoji, linking emoji represented as Unicode with English language meanings from the Web. By integrating online emoji databases with Babelnet, EmojiNet allows users to infer sense definitions from communication using emoji. 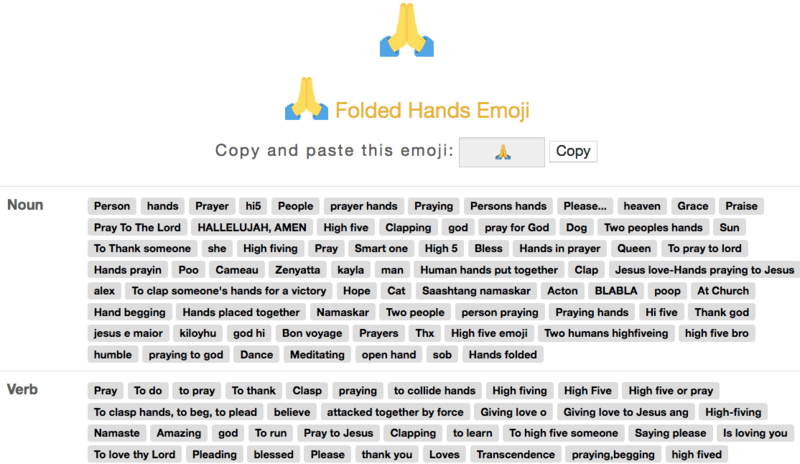 For a better picture, check out EmojiNet results for “folded hands“. The team is also focused on measuring emoji similarity by determining pairs of emojis frequently used together to enhance semantic search, and develop applications to automatically process and infer meaning from emoji based communication. These applications could improve web and database search, sentiment analysis, and interface design. Grouping similar emoji together on mobile keyboards, for example, could make texting with emoji less time consuming. Sanjaya and his team’s attempts to promote his team’s paper were frustrated by the current administration’s immigration policy. When the group’s paper was accepted at the International AAAI Conference on Web and Social Media, Sanjaya was unable to attend . A Sri Lankan native, Sanjaya is on a student visa. “We wanted to promote our paper at IABC , but If I left the country, I’d have to return to Sri Lanka to reapply.” With the current administration’s immigration policy, this is not a chance Sanjaya wanted to take. 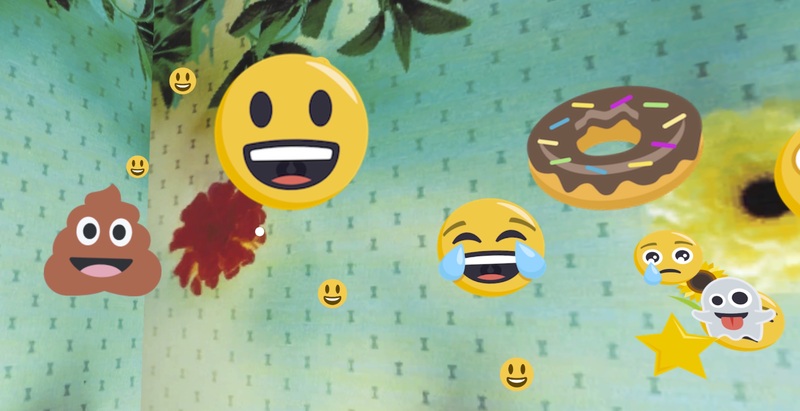 Despite earlier frustration, EmojiNet is beginning to get attention from tech companies. Recently, data science platform Kaggle inducted EmojiNet as a featured dataset. EmojiNet is also in the process of organizing an emoji prediction challenge with Google, Microsoft, and Kaggle using EmojiNet data. To learn more about EmojiNet, emoji similarity, and emoji sense disambiguation, check out these articles!